Leek’s match at Chasetown was postponed due to a frozen pitch, so my son Dylan and I were left all togged up with nowhere to go. Dylan desperately wanted an away game feel, so insisted on an hour’s drive at least! I picked on Woodley Sports v Curzon Ashton, then at the last minute changed to Warrington v Prescot Cables, being more of a direct run up the M6. 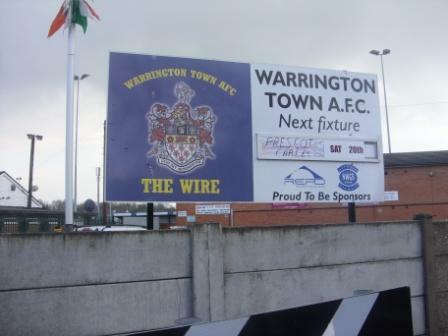 Warrington Town are 51 years old now and started out as Stockton Heath Albion before donning their present name in 1961. Their nickname, among many, is The Wire. It was a very pleasant surprise, Cantilever Park. A ground that I’d go back to again. 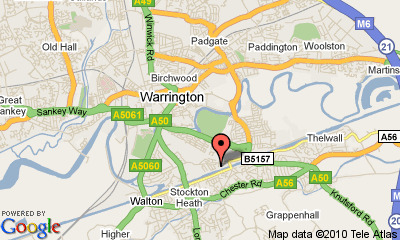 It is reasonably easy to find just off the A50, off the M6 Junction 20. Type in Loushers Lane into Google Maps. The ground lies next to the Manchester Ship Canal and is overlooked by a majestic looking cantilever bridge, hence the ground name. It’s definitely worth a walk up to the bridge beforehand. 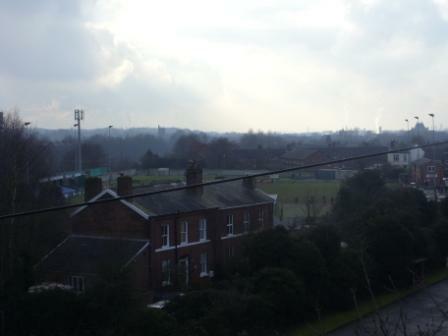 The views from it are excellent and you get an aerial view of the ground, too. There are two seated stands in the ground on either side of the pitch, and a covered terrace behind one goal. 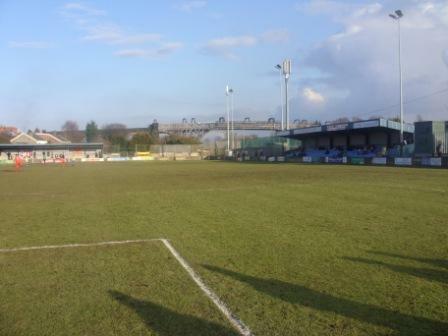 It is quite big for step four of non-league and has bags of character. Entrance was £7 with £4 concessions, except they let my seven-year-old in free. 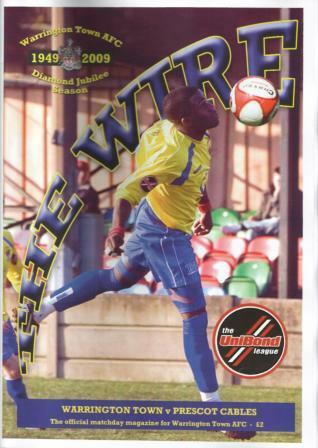 Programmes were £2 – quite pricy for this level. However, drinks at 70p and delicious chips for £1 more than makes up for it. Great snack bar. The finishing touch to a great day out was a shooting competition for kids at half time into a small goal, behind one of the real goals. They had a machine to test the speed of the kick, fastest kick wins a trophy. Dylan scored at an impressive 49mph. 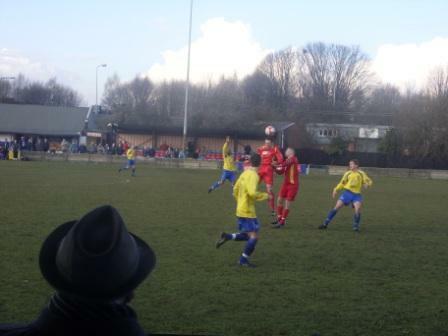 Warrington Town played some good passing football and all three finishes were top-notch. Great game for the neutral but maybe not as one-sided as the score suggests. I enjoy most new grounds I visit but Warrington was a bit special. The whole match day experience was one of my best yet, so I’d strongly recommend it to other hoppers. I also caught the thrid goal on video, Click http://www.youtube.com/watch?v=pStKjOoKQR8 . This entry was posted in Groundhopping, Non-League, Travelog and tagged Cantilever Park, Prescot Cables, The Wire, Unibond Division One North, Warrington Town. Bookmark the permalink. Delighted you enjoyed your visit to the field of dreams and hope you and other ground hoppers will return on a regular basis. Thanks for the comment and the link on Warrington’s site. 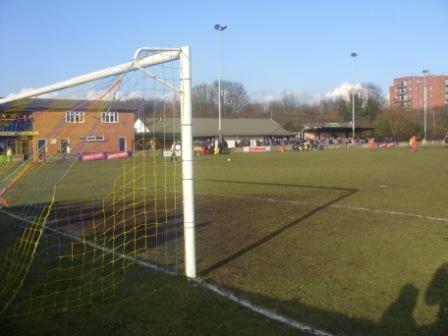 I really enjoyed Cantilever Park; a classic non-league ground. I was impressed with the quality of football too. Gavin Salmon’s finish was awesome. I support Leek Town, who are at the same level in the south division. I think Warrington would’ve beaten them that day! Looks like a good one – must go some time. 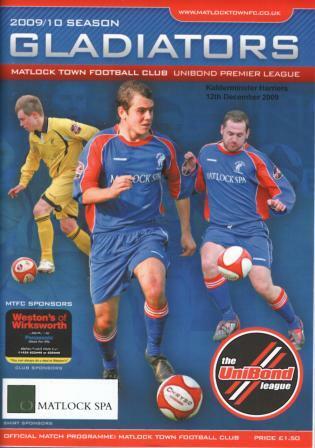 I also had a similar day; after Chasetown v Leek was called off I plumped for Trafford v Colwn Bay. Not getting much chance for pure hops these days as doing most LTFC games.